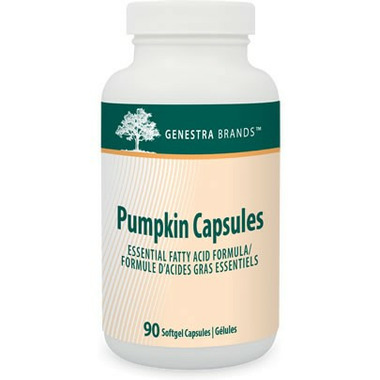 Genestra Pumpkin seed oil is naturally high in the essential fatty acid, Linoleic Acid (LA), and helps to maintain optimal health. As essential fatty acids and their metabolites are required to help form the water-impermeable skin barrier, their deficiencies can lead to scaly skin and moisture loss in the skin and eyes. Dietary supplementation with LA can reverse these symptoms as LA accounts for approximately 12% of fatty acids in the skin, and is essential to maintain the skin’s structure and function. The formation of ceramides, lipids found in the outermost epidermal layer responsible for sealing in water, also depends on LA. In addition to its role in skin health, LA is an important energy source and can be metabolized to form other lipid molecules, including triglycerides and phospholipids. As a component of phospholipid membranes, LA also helps maintain membrane fluidity to ensure the proper functioning of cells.